The LMU Munich group has published a new paper on the characterization of their experimental set-up. Th-229 recoils (hopefully many of them in the isomeric state) are extracted from a thin U-233 source. The ions are cooled, collimated, and mass-filtered before being gently deposited on a micro-electrode. This part of the set-up has already been published here. Once the Th-229m ion settles on the micro-electrode, it might de-excite into the nuclear and electronic ground state under emission of photons: either the VUV gamma, or secondary photons generated during the de-excitation process. The present paper describes the optical set-up that allows for the detection of these photons: two annular parabolic mirrors image the emission from the micro-electrode onto an MCP, which is monitored by a CCD camera. Given the efficiency of all parts of the experiment and the noise of the detector, a signal-to-noise of 7000:1 can be achieved. The paper can be found on the arXiv preprint server. While there is little doubt about the existence of the Th-229 isomeric state, a direct measurement of its energy and lifetime are still pending. The current best value of the isomer wavelength is 159(10) nm, where the error stated here is purely statistical. The uncertainty needs to improved by at least one or two orders of magnitude before is makes sense to commence direct laser spectroscopy. So far, experiments employing synchrotron radiation for excitation of the isomer have not succeeded to detect the photonic de-excitation of the isomer. While each experiment might suffer from individual challenges, is seems that non-radiative decay of the isomer might dominate over the radiative branch whenever the thorium atom is adsorbed onto (or doped into) a medium. The Vienna group now put forward a new approach to measure the isomer emission with a spectrometer. The method of isomer population itself has been used dozens of times before: U-233 undergoes alpha decay into Th-229, and, with a 2%-probability, into the isomeric state. The technological advancement is to go from surface-implated Th ions to Th ions doped into crystals. Leaping from 2-D to 3-D increases the flux of isomer gammas by two orders of magnitude! The new approach is experimentally much easier to implement and requires no pre-knowledge or “guessing” of the isomer lifetime. In a practical experiment, the signal is expected to be increased by more like 3 orders of magnitude. A number of careful experiments were required to show that this new approach is indeed feasible. At first, it was shown that uranium can be doped into CaF2 at concentrations of 1000 ppm. Second, the transparency of 233U:CaF2 crystals in the VUV was shown to be sufficiently good to allow gammas to leave the crystal. The alpha decay of U-233 leads to scintillation of the crystal, and it could be shown that this luminescence appears only in a spectral region that is well-separated from the expected isomer transition. The wavelength region around 160 nm is, however, covered by Cherenkov radiation. This radiation does not originate directly from the alpha decay, but from beta decays in the chain of Th-229. Luckily, Th-229 has a half-life (8000 years) much larger than a typical experiment. Sadly, commonly available U-233 is contaminated with U-232, which decays into Th-228 and further down the entire chain on timescales comparable to the experiment. It is the beta decays in the unavoidable Th-228 contamination that form the Cherenkov background. With a bit of theory input, the absolute amplitude of Cherenkov emission can be calculated numerically. The only input parameter required is the amount of U-232 contamination and the date of the last removement of thorium ingrowth. Modelling a future experiment with reasonable parameters, such as a U-232 contamination of 10 ppm, a 3-month period since the last purification, and a standard commercial VUV spectrometer, it is found that even if 99% of the isomers undergo non-radiative de-excitation, a clear signal can be detected within a few days of measurement. This value jumps to many months if the non-radiative decay comes in at 99.9%. Demonstrating the feasibility of this approach required contributions from experiment, theory, and radiochemistry: a truly multi-disciplinary effort! The preprint, backed by a good deal of supplemental material, can be retrieved from the arXiv pre-print server. Prof. Dr. Nikolay Minkov visited the MPIK group in Heidelberg on Nov. 16 and 17. Prof. Minkov works at the Institute for Nuclear Research and Nuclear Energy in Sofia, Bulgaria, and is a specialist in collective models and nuclear deformation. Today, he gave a seminar talk on “Deformations and magnetic moments in nuclear high-K isomeric states”. In addition, there were very fruitful discussions on the nuclear physics part of Th-229. Experts in the theoretical description of nuclear isomers are exactly what we need! Thanks to Nikolay Minkov for visiting! 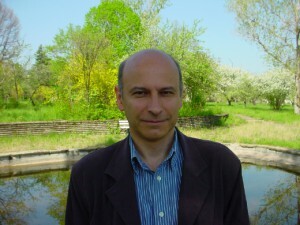 Prof. Nikolay Minov, visit his webpage for more information. It’s been precisely 3 months since the nuClock website went online! Every day, the website is currently visited by 30 people on average. Close to 500 visitors have found our site already and clicked on our pages more than 3000 times. Today, we are launching a new category, called “resources”. As a service to the entire Thorium research community, we have established a repository for information and data that we believe to be useful. It might be especially helpful for all of the newly established research groups around the world that are currently joining the Thorium research activities. We are starting with a library of the 100+ publications that we consider most relevant for our field of research. There is also a set of links to fabulous places on the internet where one can find nuclear and atomic physics data. In addition, we have started with a list of Thorium research groups around the world (yet not affiliated with nuClock). We seek to constantly expand our data and knowledge “resources” section. At the same time, it will remain a carefully curated selection of truly essential information (and not a dump for all the stuff that we ran acoss). Please send us material that you find could be useful for the community!